The DL32R features flexible, professional I/O in an incredibly compact design. So you can place it anywhere and it's "Built-Like-A-Tank", so it'll stand up to life on the road. Recallable Onyx+™ mic pres provide unmatched clarity and control. 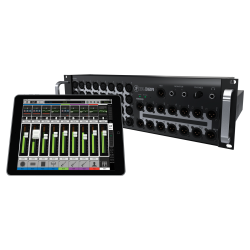 DL32R has outputs galore with 14 assignable XLR outputs, stereo AES, phones out, and 1/4" monitor output. The optional DL Dante Expansion Card gives you 32x32 channels of networked audio compatible with hundreds of Dante equipped devices. DL32R is also part of the Mackie AXIS Digital Mixing System, which delivers an ultra-fast workflow through unmatched visual feedback and customization for professional production and system integration. With full Dante® interoperability, the modular AXIS system combines the power of the 32-channel DL32R™ digital mixer and innovative DC16™ control surface to deliver a forward-thinking, modular digital mixing solution with more features per price than any other digital mixer available.